Optional: Batch coding, Nitrogen Flushing and special Custom Built Features. Packaging Range (Gms): Upto 500 ml. Dimension: 1700(H) x 800(W) x 1200(Depth). Net Weight: 400 kg (approx). - Capacity : 1 -5, 10-50, 50-100 gms, 100-250 gms. Our wide range of automatic pouch making machines encompasses a highly functional range of FFS weight filler automatic pouch packing machines. These machines are used to fill the packing film with the product and heat sealing them in a continuous form. These pouch packing machines are robust in construction and are offered to our clients in customized specifications. 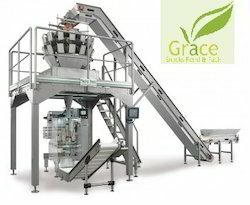 We are known for providing technically advanced FFS Pouch Packing Machine at most reasonable rates. Our FFS Pouch Packing Machine is widely used to pack pouches of various items such as sauce, shampoo and many more. 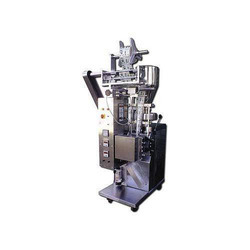 Defect free packaging is provided by this FFS Pouch Packing Machine.